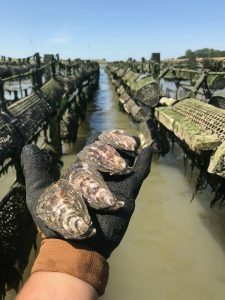 As soon as the seeds have reached the desirable size (end of the nursery phase) it will be sold to local oysterfarmers or abroad. Part of the seed will be used for our own grow-out trail to control the quality of the seed. 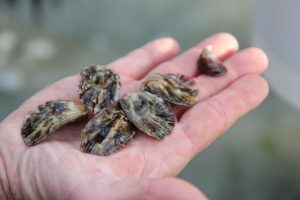 For the ongrowing of seeds in oysterbaskets the seed needs to be at least 10mm in size (T6). Therefore we use 4 mm mesh. During the cultivation season the seeds will be graded en transferred to bigger sized baskets. Within 12-16 months the seeds could grow up to consumption size (appr. 50 gram). The advantage of this type of culture is the manageability, the disadvantage is that is quite labourintensive.